Funding for the Supplemental Nutrition Assistance program, commonly known as food stamps, is a hot-button issue in Washington. An estimated 20,000 Kansans without children now have the next 90 days to either get a job or enroll in job training to keep their food stamps. Calimah Brown needs special infant formula to feed her two-month-old baby, but it’s expensive. She says each month nearly half her $314 in food stamps goes for the baby’s food. "I probably have to buy it probably about every 15 days, and that’s basically what I buy with my food stamps," she says. "I would probably buy about five cans, which come up to $142 dollars." This leaves Brown with about $172 dollars a month to feed her and her unemployed fiancée. Brown will not lose her food stamps, because those with children are still eligible. Brown says she doesn’t have a problem with the tougher requirements in Kansas. "I was raised with my brother who fed us all with cash, he worked," she says. "I think they should have a time frame on having food stamps... a limit... because it makes people lazy when you just giving and giving. They don’t want to do anything." Advocates for the poor see it differently. They say there will be several adverse ripple effects as a result of the changes. Kansas City area food banks say they could see double the number of people at feeding sites and food distribution centers – an unsustainable increase at a time providers say they’re already stretched to the limit. Economist Linwood Tauheed, an expert on community development, says the cuts can have a negative impact on the economy because the money people spend at the grocery store ripples out into the larger economy: coffee houses, department and electronics stores, even the real estate market. 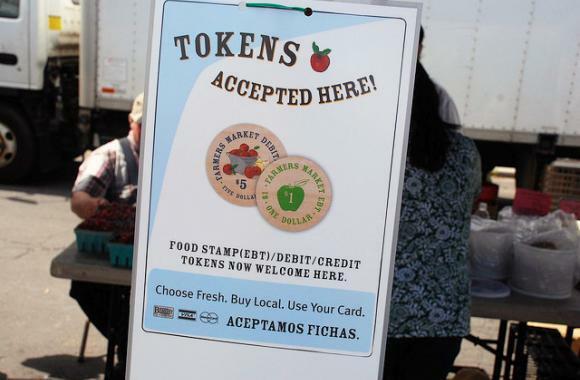 "Food stamp programs are what are called countercyclical," Tauheed says. "When the economy is worse, those programs expand, which actually helps to stimulate the economy, puts money into the economy that would not normally be there." An analysis by Moody’s Analytics says every dollar spent on food has a multiplier effect, putting roughly 75 cents back into the economy. Even though Kansas has relatively low unemployment at 5.5 percent, the Kansas Department of Labor reports available jobs are in low paying, unskilled positions. In these still shaky economic times, Tauheed says, job training won't help. "Spending money for food stamps makes more sense than spending money on jobs that don't exist," he says. Phyllis Gilmore, secretary of the Kansas Department of Children and Families, disagrees. She says the move in Kansas amounts to an act of tough love. "I strongly believe people can take care of themselves, I have confidence in the human spirit and that people are able and that we don’t want to encourage dependency," she says. "This is a hand out reaching up to help people up out of poverty through employment." With 14 percent of Kansans living below the poverty level — that’s $22,000 a year in food stamps for a family of four — critics of the change in the rules say it is patronizing and unrealistic. But it's also part of a trend. Eight other states either have, or are in the process of, requiring able-bodied single people to work for food stamps — all while disagreement in Washington simmers about how much to fund the overall food stamp program. On this week's Business Beat: 47 million Americans are enrolled in the SNAP program, or food stamps, including nearly 16 percent of Missourians. SNAP is the biggest spending item in the farm bill. And the program has a big bulls eye on it as Congress debates new legislation. As Grant Gerlock reports for Harvest Public Media, the economic considerations go beyond who receives SNAP benefits to how and where the money is spent. April Segura is a regular at the Old Cheney Road Farmers Market in Lincoln, Neb. On a warm, May afternoon, the single, stay-at-home mother of three greeted friends and acquaintances while strolling past tables of lettuce and herbs. She hoped to find more asparagus for sale. 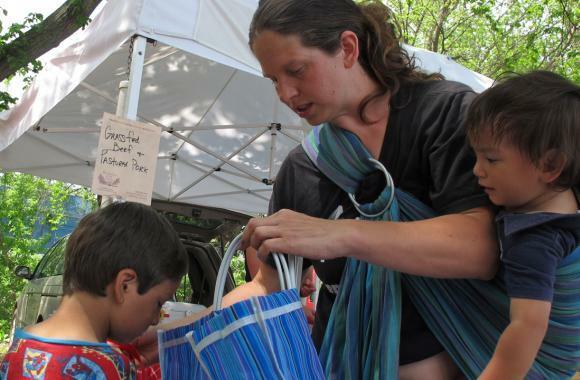 “I love asparagus season and it’s probably about to be over,” said Segura, holding two grocery bags with one arm and her one-year-old son, Jeriel, with the other.